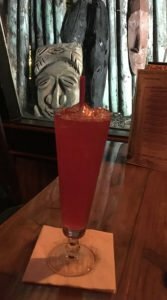 The concept of a “Polynesian” cocktail is somewhat of a misnomer. While most tropical drinks have names and imagery that recall Polynesia, most are actually Caribbean rum concoctions reinvented by American restaurateurs. One notable exception is the distinctive Doctor Funk, also sometimes known as Dr. Fong. 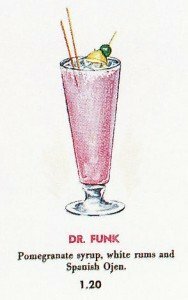 Doctor Funk was an actual person as well as a real Polynesian drink. 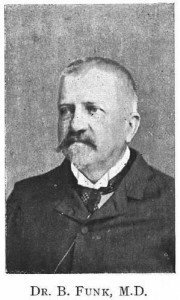 Born in 1844 in Germany, Dr. Bernhard Funk migrated to Samoa around 1881 and was reputedly the first medical practitioner in the capital city. He became friends with Scottish novelist Robert Louis Stevenson (author of Treasure Island and The Strange Case of Dr. Jekyll and Mr. Hyde) and was the bedside doctor when Stevenson died in 1894 in Samoa. From a Don the Beachcomber menu. Dr. Funk thrived in Samoa, marrying the daughter of a chief, but health problems caused him to return to Germany, where he died in 1911. After his death, a granite stone was placed in his honor on the shore of the mysterious Lake Lanoto’o in Samoa, where Funk had built a health resort. The secluded lake still contains goldfish, illegally introduced to Samoa by Dr. Funk. For a lot more on the life and times of Bernhard Funk, check out this great research on Tiki Central by Sven Kirsten (bigbrotiki), Tom Duncan (TikiTomD), and many others. A drink this legendary and rooted in the South Pacific was perfect fodder for Tiki bar pioneers Donn Beach (Don the Beachcomber) and Victor Bergeron (Trader Vic). Both created Doctor Funk cocktails in the 1930s and ’40s with pretty much the same flavor profile. But over the years there became so many different versions by Beach, Bergeron and many others, it became impossible to pinpoint a definitive “original” version. Doctor Funk also inspired variations with names such as Dr. Fong and Dr. Wong. Many of these became synonymous with the (now somewhat politically incorrect) Fu Manchu-style Tiki mug that was widely produced in the mid-century. Restaurants across the country simply invented their own drinks called Doctor Funk or Dr. Fong to go into the mug (see “bilge” at the very bottom of this review). 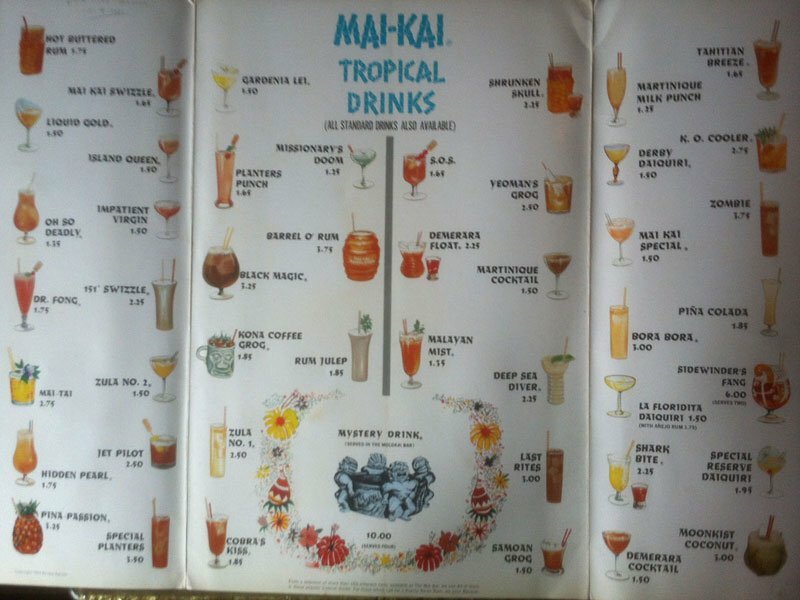 When The Mai-Kai opened in 1956, the menu included a Dr. Fong cocktail based on one of the Don the Beachcomber versions of Doctor Funk. This is where bartender Mariano Licudine worked for nearly 20 years, mixing the drinks that became the template for most of the original 1956-57 Mai-Kai menu. Luckily for us, Tiki historian and author Jeff “Beachbum” Berry has over the past 15 years decade published two of Beach’s Doctor Funk recipes, which I’ve included below. In 2016, thanks to another author, guests at The Mai-Kai were finally able to taste the authentic Dr. Fong after an absence of more than 40 years. 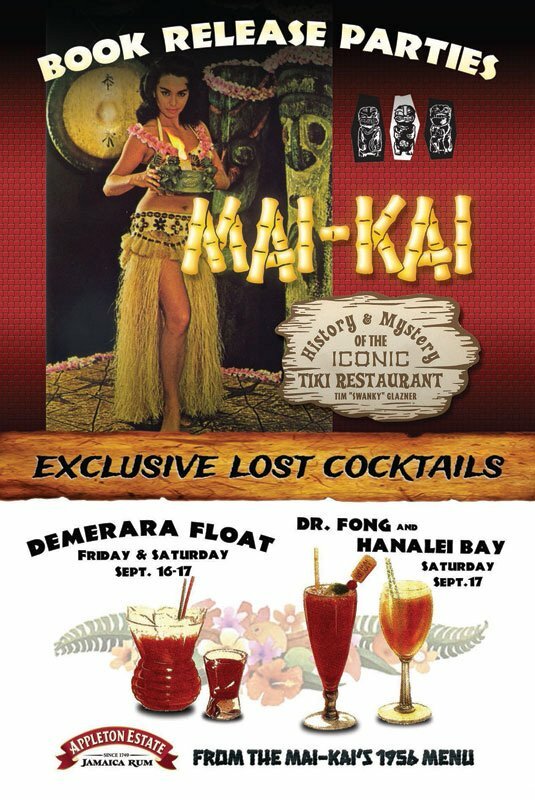 Dr. Fong was featured on a special lost cocktails menu in September 2016 during the book release party for Mai-Kai: History and Mystery of the Iconic Tiki Restaurant by Tim “Swanky” Glazner. The book chronicles the history of the iconic restaurant, named to the National Register of Historic Places in 2014. Pick up the book on Amazon or get a signed copy in The Mai-Kai Trading Post gift shop. It’s also usually available in the new online ordering app. Dr. Fong returned again in August 2017 as part of The Mai-Kai’s monthly Flashback Friday promotion, including a special new recipe. See more below under the Tribute recipe notes. Shake everything – except soda water – with 1 cup crushed ice. Pour into 12-ounce chimney glass and top with soda. Shake everything – except soda – with ice cubes, then add soda to the shaker and stir. Pour unstrained into a pilsner glass. If necessary, add more ice to fill. Published in 2002, the Intoxica version from 1937 is the oldest Tiki-era Doctor Funk recipe I’ve seen. It’s extremely sour (due to the large amount of lime and lemon) and features powerful anise notes from the heaping helping of Pernod. This was most likely Donn Beach’s ode to the pre-Tiki original, which by all accounts was simply absinthe, limes, grenadine and water. It’s actually quite well-balanced thanks to the dark rum and grenadine. See our brand recommendations below. Seven years later in Remixed, Berry published a 1953 version that’s much more subdued. He wrote that he got e-mails from readers complaining that the earlier version was way too citrusy. The update is indeed lighter and less sour, more attuned to mid-century tastes. As it turns out, this version most closely resembles the one served at The Mai-Kai (see tribute recipe below). 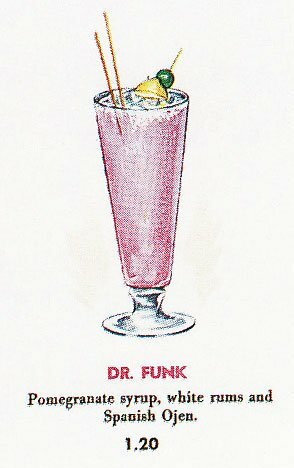 Note that Trader Vic also had multiple versions of Doctor Funk, which you can check out on The Webtender Wiki. The common thread running through most of them is rum, lemon or lime, grenadine and anise (absinthe/Pernod/Herbsaint). Click here for an interesting comparison by the Pegu Blog of three Doctor Funk recipes: 1953 Don the Beachcomber, 1948 Trader Vic, and the 19th century original. 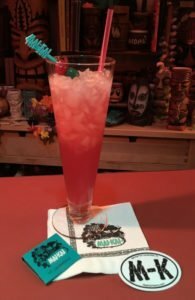 Another fine Doctor Funk recipe can be found in the James Beard Award winning book Smuggler’s Cove: Exotic Cocktails, Rum and the Cult of Tiki by Martin and Rebecca Cate, released in 2016. Pulse blend everything – except club soda – with 1 1/2 cups of crushed ice for 4-5 seconds. Pour into 12-ounce chimney glass and top with soda. Stir and add more crushed ice to fill. Garnish with speared red and green maraschino cherries. UPDATE: If you’re averse (or not accustomed) to Pernod, this cocktail can be jarring. The heavy anise flavor hits you in the face, but it’s actually a very balanced drink with sweet and tart flavors pushing it to surprising heights. 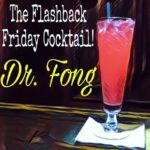 In August 2017, The Mai-Kai brought Dr. Fong back for its monthly Flashback Friday promotion. As a special twist, absinthe was used instead of Pernod, creating a more rich and earthy flavor. The amount is cut by a third, so it’s not quite as spicy. But the drink still packs an anise punch and it’s probably a more balanced version. Since tasting the resurrected recipe in 2016, we’ve adjusted this tribute recipe to more closely resemble the 1953 version above. Which makes sense since Licudine left Don the Beachcomber in Chicago for The Mai-Kai in 1956. It would have been among the newest recipes in his little black book. 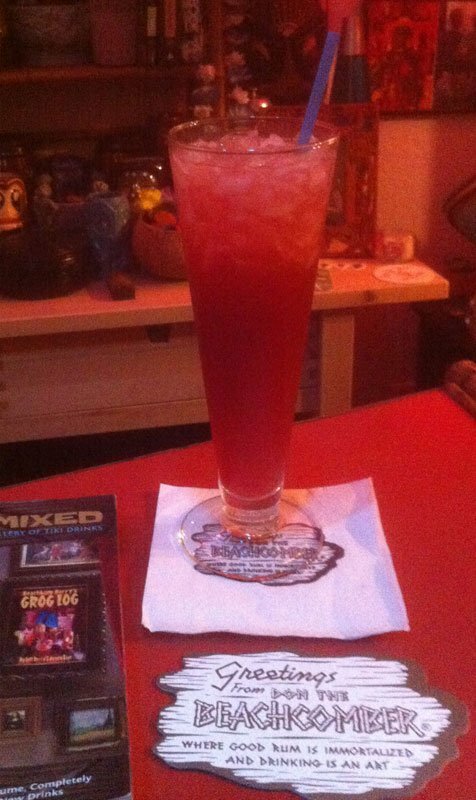 * The Mai-Kai’s lime juice and pomegranate grenadine are both rich, tart and distinctive. The key lime juice blend comes fresh from an area grove. [More on The Mai-Kai’s juices] We recommend another recent discovery, Monin pomegranate syrup, as the most bold and fresh option beyond making your own. It’s works great in some of The Mai-Kai cocktails that require a blast of tart pomegranate, such as this one and the Shrunken Skull. * By now, you’ve probably noticed Pernod in quite a few Mai-Kai cocktails. It’s an essential flavor that helps balance some of the sweeter drinks (Cobra’s Kiss, Jet Pilot) and gives others a distinctive anise flavor (151 Swizzle, Zula #1 and #2). Created in 1928 to fill the void when the infamous absinthe was outlawed, Pernod (an 80-proof liqueur) is made by the giant liquor conglomerate Pernod Ricard. Company founder Henri-Louis Pernod was the first to commercialize absinthe in France in 1805, when the high-proof spirit was the toast of Paris. Absinthe’s distinctive flavor comes from anise, wormwood and fennel. The 80-proof Pernod, which is technically considered a pastis, is basically absinthe with the allegedly hallucinogenic wormwood removed). Its distinctive flavor is created through a combination of star anise and fennel, plus 14 aromatic herbs including camomile, coriander and veronica. Absinthe (also made by the Pernod brand at 136-proof) legally returned to U.S. bars and stores in the early 2000s. But Pernod, which was used extensively by Don the Beachcomber and other tropical drink pioneers, is still preferred in most Tiki cocktail recipes due to its bolder flavors (and typically lower cost). It’s still a bit pricey, but a bottle will last you years, if not decades. It’s also a popular ingredient in cooking due to its ability to add flavor without overpowering a food’s natural taste. In cocktails, however, a deft hand is required. It’s typically added in precise drops (with an eyedropper or very small dasher bottle) rather than traditional imprecise dashes. NEW: The udpated version of Dr. Fong that The Mai-Kai served in August 2017 does indeed contain absinthe, and we confirmed that 110-proof Absente is the brand that was featured. It was likely left over in the back bar from The Mai-Kai’s entry in the 2016 South Beach Food & Wine Festival, the Pupule Punch. * A clean, Spanish-style white rum works best in this tribute, as well as the 1953 ancestor above. The rum should impart only a hint of flavor. The Mai-Kai likely uses Don Q Cristal or Bacardi from Puerto Rico. There are many other budget-friendly, high-quality options (from Cruzan to Flor de Caña to craft American brands such as Wicked Dolphin). Of course, in the rest of the world you can’t go wrong with Cuba’s Havana Club. In the recipes above and below that call for dark Jamaican rum, we recommend something not too overpowering but still containing some rich flavor. Appleton Estate 12 is always a great option. It’s one of The Mai-Kai’s preferred rums, along with Appleton Estate Reserve Blend. [More on Appleton at The Mai-Kai] Other recommendations include Coruba and Blackwell (both distilled and blended by J. Wray & Nephew, which owns the Appleton brand). Flavor profile: Anise, lime, grenadine, just a hint of light rum. Review: Bold and refreshing with sharp anise notes. Fans of black licorice and exotic flavors will enjoy this. Rating: 3 1/2 out of 5 stars (see how it ranks). Like several of the previously reviewed lost classics – Demerara Cocktail, Hanalei Bay and Last Rites – this would rank smack dab in the middle of our rankings. 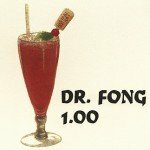 Ancestry: The Mai-Kai’s Dr. Fong was no doubt based on Don the Beachcomber’s Doctor Funk, which has a rich and colorful history (see above). It was on the original 1956-57 menu and was still there in 1970. It was gone by 1979, when the current mild/medium/strong format was in place. As old cocktails bid farewell, this era ushered in some of Mariano Licudine’s signature cocktails such as the Mara-Amu and Mutiny. Bilge: A cocktail called Dr. Fong is the signature drink at Chef Shangri-La in North Riverside, Ill. This Chinese restaurant with a robust vintage Tiki bar was opened in 1976 by Paul Fong, a chef who had worked at Chicago’s Shangri-La restaurant as well as Don the Beachcomber and The Mai-Kai. By all accounts, however, this version of Dr. Fong is more of a tribute to the chef and less of a Doctor Funk knockoff. 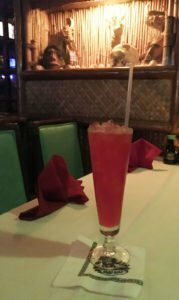 Chef Fong sadly passed away in May 2012, but his family-run Tiki paradise is still alive and well in the Chicago suburbs and very much worth a visit. If you’re looking for yet another Doctor Funk-style recipe, try Dr. Wong from the Luau in Beverly Hills, circa 1953. 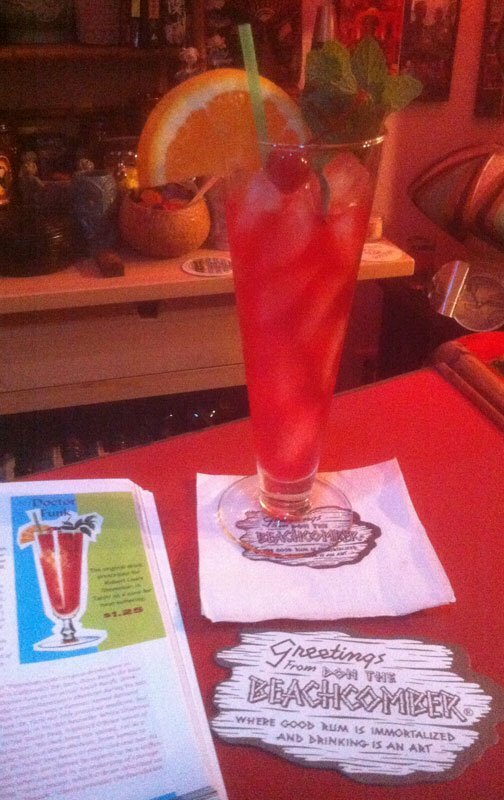 It’s in Beachbum Berry’s Sippin’ Safari (2007) and Total Tiki app, along with the theory that it was probably created by one of the former Don the Beachcomber bartenders working at the Luau at the time. Look for a special 10th anniversary edition of Sippin’ Safari in 2017. So what happened to The Mai-Kai’s Dr. Fong? It could have been the odd flavor, or maybe it was considered to be too old-school. Maybe it was simply removed to make way for some of Licudine’s newer concoctions. The true reason remains shrouded in as much mystery as old Doctor Funk himself. Agree or disagree with this review? Share your comments below! This entry was posted in Cocktail reviews, Cocktails, Cocktails, Culture, History, History, Mai-Kai, Recipes, Rum and tagged absinthe, Beachbum Berry, cocktails, Doctor Funk, Don The Beachcomber, Dr. Fong, Mai-Kai, Mai-Kai: History and Mystery of The Iconic Tiki Restaurant, Mariano Licudine, pernod, Pernod Ricard, pomegranate grenadine, recipe, rum, Samoa, Swanky, Trader Vic's. Bookmark the permalink. I will confirm to be a fan of the 53, It’s not as rum forward as some tiki cocktails but I think it has a brightness and a marriage of flavors thats very wonderful after a hard day’s work. Plus the anise notes delight me especially. I can’t wait to try your variant it looks delicious! I wish I had intoxica and grog log as well because I always wonder what recipes I am missing. I am a completionist if I am anything. I’ve often flirted with making more modifications to the 53. Particularly in changing the rums and/or omitting the soda. The Dr. Phibes was actually a result of my tinkering on the 53. Looking forward to giving yours a try! I must say that your interpretation of Dr. Fong is the best pastis-heavy-drink I’ve ever tried! Thanks for posting this!